Story: Kate (Catherine Zeta-Jones) is the master chef at the trendy 22 Bleecker Street Restaurant in Manhattan. She runs her kitchen at a rapid pace as she coordinates the making and preparing of all the fantastic meals and personally displays the food to perfection on every dish. She intimidates everyone around her, so her boss sends her to therapy. Kate hates to leave the kitchen when a customer wants to compliment her on one of her special dishes, but she is ready to leave the kitchen in a second when a customer insults her cooking. Kate's sister is killed in a car accident and her nine-year old daughter Zoe (Abigail Breslin) moves in with Kate. With all of Kate's problems, the boss hires a new chef to join the staff. 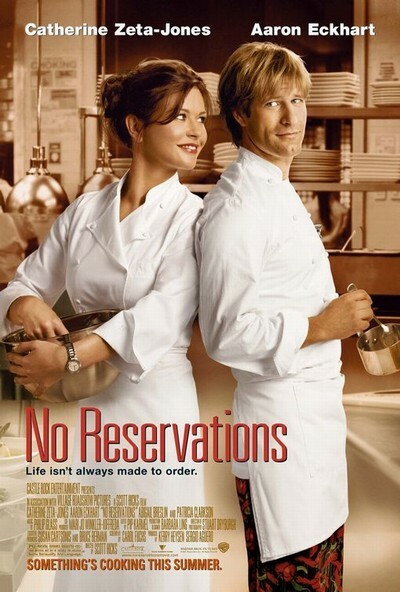 Nick (Aaron Eckhart) is a rising star in his own right and could be the head chef of another restaurant, but he wants to work under Kate. Kate begins to feel threatened by Nick, because he has a different style of running the kitchen. Nick loves to listen to opera when he cooks and to make the staff laugh. With all that is going on in Kate's life, falling for a man is the last thing she was looking for. There is some kind of chemistry between Kate and Nick that can only go one way. Yet life will hit her in the head when Kates boss offers Nick the head chef job.